The fiend swept forward and began to smite Beckles, profane energy swirling through the air as claw, tentacle, and tongue struck him one by one. The inverted Giant surged out of his prison, tasting fresh air for the first time in centuries. Letting out a mighty roar, the beast surveyed the area around it. Standing before it, fists at the ready, was Beckles. However, this creature was not like those we had fought before. Before we could even make a move the fiend swept forward and began to smite Beckles, profane energy swirling through the air as claw, tentacle, and tongue struck him one by one. Then in one monstrous gulp, Beckles was swallowed whole and disappeared down the gullet of the giant. We were taken aback by the ferocity of the creature, but The Incredible Fella shook himself from the daze and began to pelt it with arrows. The beast screamed as bolt after bolt pierced its flesh. I tried to finish it with a vile curse, but once again an overwhelming, mythic force prevented me. At that moment, Barca stepped out of a portal, seemingly from nowhere. “Sorry for the delay, friends, I was reading a really good scroll!” With a smile and a wave of his hand, he transformed into a huge Dragon and blasted the beast with a ray of frost. 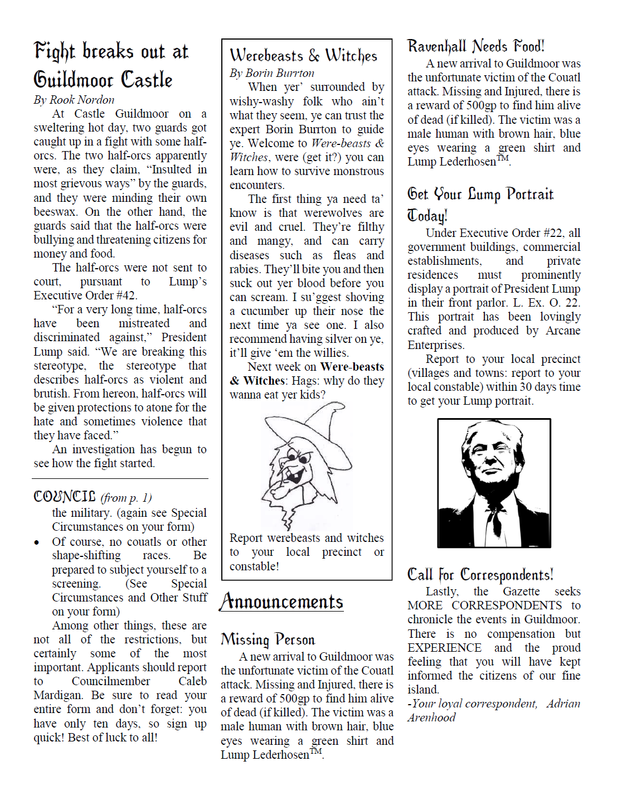 Wherein Susurrus, the party wizard, tells how the party fared against Orcus temple and an ancient undead army. Things were looking bleak — well, I was fine but the rest of the party was not — they were slowly having their strength sapped from them by shadows and a few dread wraiths. It looked like I would have to save them, if I wanted them to live. Before I did anything towards saving the party, The Wall Flesh (a.k.a. Bright Yilling), who had been watching us with the Holy One, created a gate that opened toward the sun; and rendered the dread wraiths powerless. Though it was not enough, as Living Flame and Sir. Yells-O’-Lot both fell into a coma. 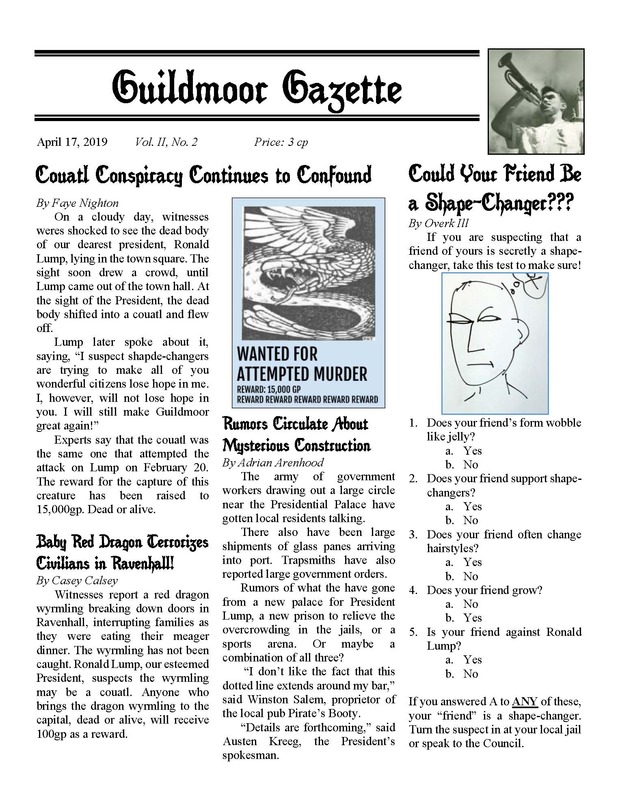 I was enjoying the chaos, but I felt like I would incur the wrath of some extra-dimensional being if I did not at least try to save the party. So I reluctantly used my scroll of meteor swarm to decimate the remaining shadows. We then finished clearing the room with minimal effort. While the rest of the party was healing I decided to go scout ahead to find out what was making a ruckus in the next room. I saw what appeared to be a market and an undead army heading our way. From the banners they carried I surmised that this was the Army of Tsar Also known as the Army of Twilight. After a short discussion we decided to send half of the party home and face this undead horde as a three-man team. The ensuing battle was more or less a massacre. I started the fight by hitting the forward portion of the army with a large amount of holy tentacles. Then the army’s archers and ballistas launched a volley of projectiles at The Wall Flesh, most of which missed. In response I entangled the army’s ballistas, archers and any evil creature unfortunate enough to be caught within the area of effect of my second round of holy tentacles. At the same time, Irrelevantly Far Away bowed down a graveknight who was probably a general or something of the sort. There was also an empyreal angel which had been corrupted and become a deathleech. Though it seemed like it might be a worthy foe, all it did was charge at us before dying. Probably the most interesting part a fight was when I cast polar ray on a marilith demon and it turned out to be wild. The polar ray was apparently very scary because it caused the marilith and 2 hezrou demons to run away in fear. After cleaning up the remaining undead, we then proceeded to take everything and anything worth something so that we could sell it at the capital to make some gold. 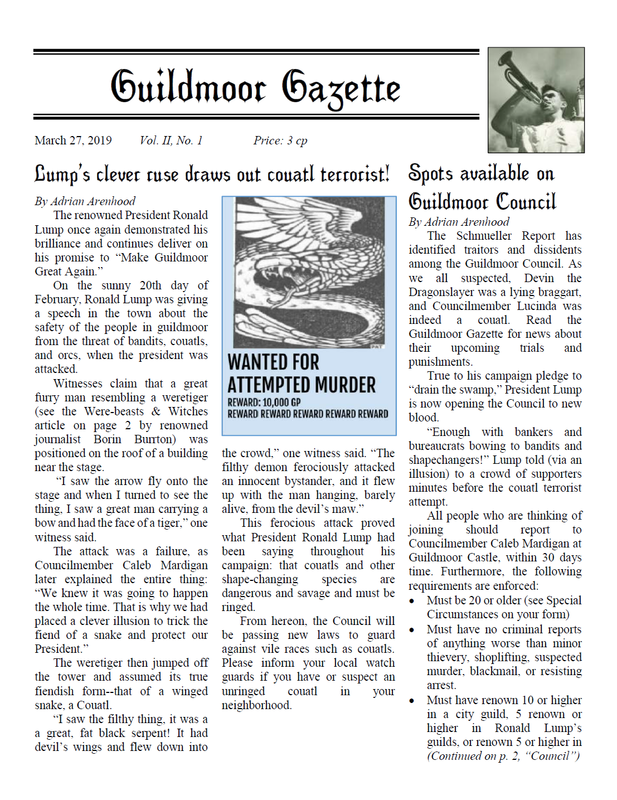 Guildmoor Gazette #4: Lump’s Clever Ruse Draws Out Couatl Terrorist! Barca and Fella were “too tired” to continue exploring, so we were operating in diminished capacity. The room we were in had the four artifacts on the ends and the four jars plus the replacement statue in the middle. Clearly we were supposed to do some sort of ritual to unlock the artifacts. But what? I decided to ask the altar itself. “So, bowl, what do people usually fill you with?” I asked. “Water. Dirty water.” it replied. Fortunately, Alderpash had some unholy water on him, so we went and got it, then poured it in the four bowls. The first one unlocked Baphomet’s own glaive. The second unlocked a scimitar that was forged from the shards of Sarenrae’s battle with Rovagug at the dawn of creation. Maybe we could carbon-date it and disprove the “the universe is billions of years old” myth once and for all. The third held the Herald’s heavy heavenly heart. It probably wouldn’t be that useful, as I was planning on just resurrecting him. The last one had a ball of twine. Nothing special or magical about it, just a bunch of string. We threw it all in the sanctum.